Trudy Wassel | State of Alaska Apr 13, 2018. 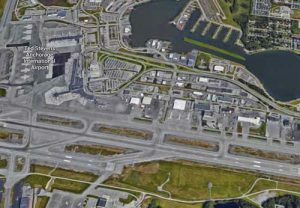 (ANCHORAGE, Alaska) – Ted Stevens Anchorage International Airport (ANC) continues its strong growth in the air cargo market by being recognized by Airports Council International as the fifth busiest air cargo airport in the world, moving up from sixth place in 2016. In addition to being the fifth busiest in the world, ANC repeated as the second busiest in North America, a position it has held for over a decade. In 2017, cargo grew by 7 percent from the previous year, with a total landed weight of nearly 3 million tons of cargo. On average, more than 75 wide-body cargo jets land at ANC each day, taking advantage of the airport’s strategic location between Asia, North America, and Europe. Each year, more cargo carriers recognize the benefits of using ANC as a stopover, allowing them to carry less fuel and more cargo, and to take advantage of ANC’s unique cargo transfer capabilities.“The really exciting thing is that when the airport enjoys success, it’s something that benefits the whole city,” Trudy Wassel, Division Operations Manager added. In fact, one in 10 jobs in Anchorage is directly linked to the Anchorage Airport. The top five cargo airports in the world this year were, in order, Hong Kong; Memphis, TN; Shanghai, China; Incheon, Korea; and Anchorage. Airports Council International is the trade association of the world’s airports, and serves 1,953 airports in 176 countries. Their airport ranking is considered the industry standard.